1) Horseback Riding Lessons for Adults: Whether you are returning to riding after some time off, or just want to continue to improve your skill level, you have come to the right place. Our respected lesson program centers around attaining goals appropriate for each student's ability level and learning in a fun, non-judgmental atmosphere. We stress the basics in our "Foundations of Riding" lesson series and offer advanced level dressage and jumping for experienced students. For more information about riding instruction at Laurel Ledge Farm, click here . 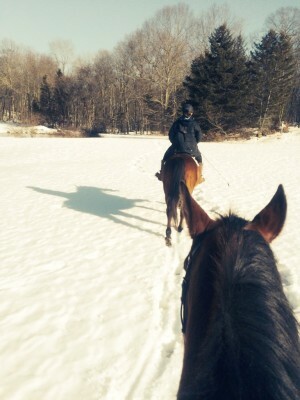 2) Horse Boarding in New London County, CT: Have your own horse? Natural board is available to our lesson students on a limited basis. Over the years we observed how much happier and healthier our horses are when left outside 24 / 7 (Stalls are available for sick or injured horses). We have several large paddocks, each with a run-in shed. Horses move freely and enjoy the companionship of their paddock mates. They have unlimited hay fed in slow feeders, plus high-quality grain fed twice daily. One of the first things most people visiting the farm notice is how content our horses are. The staff is on the premises 24 / 7 ($600 / Month + lesson package). Based on ability level and instructor approval, a trail ride is typically offered to students after most lessons. 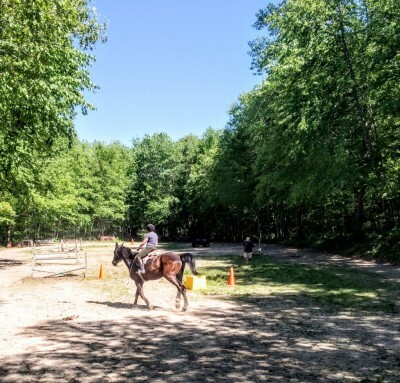 Students who wish to trail ride report how much they and their horses enjoy and benefit from riding on the beautiful wooded and open land surrounding the farm. Additional trail rides can be scheduled (with instructor approval) and are typically the second ride of the week in addition to a scheduled lesson. There are many trails surrounding the farm that wander through a variety of terrain and vegetation. Students and horses love the unstructured time exploring the beautiful hills and dales surrounding the farm. Click here for more information. 4) Drill Team: Available to students who want to ride a second time each week in addition to their scheduled lesson. This fun learning opportunity requires no previous drill team experience. Learn all the basics and progress to more complex drills. 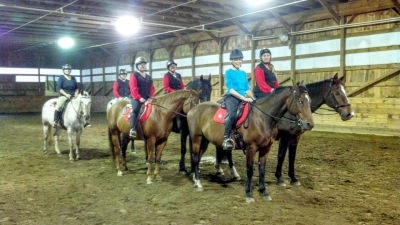 All our drill team participants have improved their riding skills and enjoyed the camaraderie of the other team members. 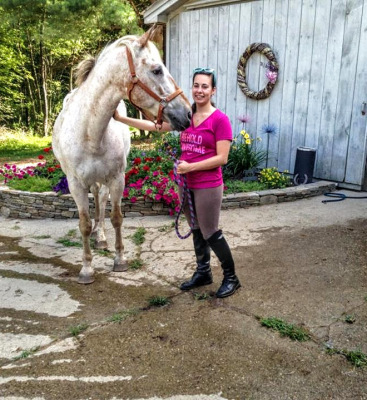 5) " Horse Lover Fix ": Are you a horse lover who doesn't have the time or budget to ride? The Laurel Ledge " Horse Lover Fix" may be the solution and is available to adults with horse experience. Spend unmounted time with one of our lesson horses ... Brushing, grooming, walking, hand grazing, etc. This is also an opportunity for "Natural Horsemanship" students to "play" with our horses and improve their communication skills. ($25 / 2 Hours). 6) Rider Flexibility: By popular demand, deep tissue massage is offered at Laurel Ledge Farm the first Monday of every month. Amy Terray DC, a licensed chiropractor with years of therapeutic deep tissue massage experience, is available to students for 30-minute sessions. Our students report an improved range of motion and greater flexibility making them more effective riders ($80). 7) Rental of Laural Ledge Farm Equine Facility for Your Show or Clinic: Half and full day rates are available and include the use of the indoor and outdoor arenas, plus heated lounge and bathroom. Trailer parking for participants is included. Large, airy stalls (bedding, food and stall cleaning is by the participant) are also available for rental on a daily basis. Convenient location in Southeastern CT with plenty of parking. Please call for pricing. 8) Use of Laurel Ledge Farm for Photo Events Like Weddings, Graduations, Reunions, etc: Our beautiful farm is the perfect backdrop for any event and includes the use of all the outdoor areas on the farm, plus the heated bathroom and lounge. Call for pricing. 9) Referrals For Laurel Ledge Farm Near Montville, CT: We appreciate your business and would like to thank you when you have an opportunity to refer us to your friends. Once your referral has completed their 3rd lesson, you earn a free ride or two “Horse Fix” sessions! All you have to do is let us know their name and when you want to schedule your ride or “Horse Fix” time.